The Republic of Indonesia is located in Southeast Asia on the equator between the Indian and Pacific oceans, and is the world’s largest archipelagic nation. 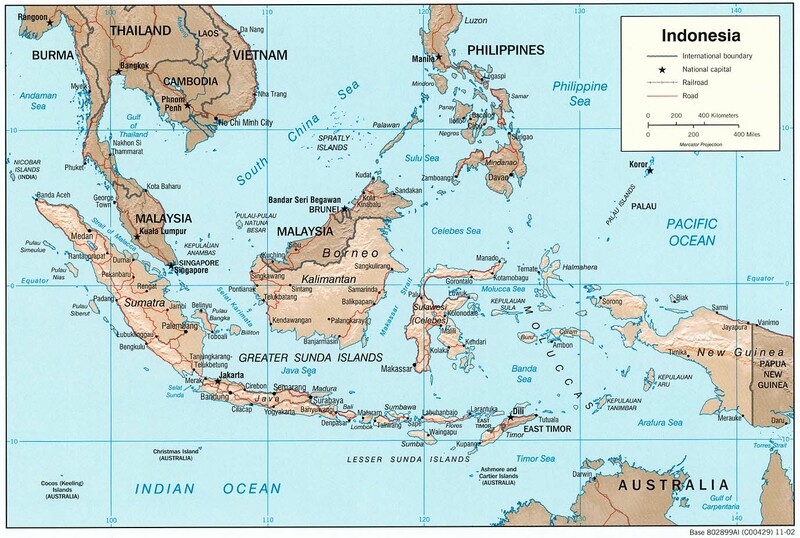 It encompasses about 17,508 islands, five main islands, two major archipelagos, and about 60 smaller archipelagos. The capital of Indonesia is Jakarta (known as the national capital district), and the country as a whole is divided into 31 provinces, 1 autonomous province (Aceh), and 1 special region (Yogyakarta). The population of Indonesia is around 253,609,643 and is the largest Islamic nation in the world by population. Indonesia’s population is also one of the most diverse in the world with about 350 recognized ethnolinguistic groups, and around 731 other languages and dialects spoken across the archipelago. Bahasa Indonesia (or Indonesian), a modified form of Malay, is the official language of Indonesia with an estimated 17 million to 30 million people who speak it as a first language and more than 140 million people who speak it as a second language. While undergoing a period of political instability and military rule following its independence from Dutch colonial rule, Indonesia successfully transitioned to democracy in 1998 and is now one of the world’s fastest growing economies. Despite its success, Indonesia still has numerous developmental challenges. There is the question as to whether or not Indonesia will continue its rapid economic growth and if so, what significance the growing power of Indonesia will have for the region, and whether or not Indonesia will ultimately choose to align with either the US or China. Indonesia has a long history, with Austronesian peoples arriving on the archipelago from the Philippines around 3000 BC, which later gave rise to various Buddhist and Hindu kingdoms throughout the archipelago. By the 13th century Islam was brought to the region by Muslim traders and Islam eventually became the dominant religion of Indonesia. The Dutch began to colonize Indonesia in the 17th century and eventually came to dominate most of the archipelago. World War II resulted in Indonesia being conquered and occupied by the Japanese from 1942-1945. The Japanese occupation is remembered as a brutal period in Indonesian history, but the Japanese helped promote the Indonesian independence movement. Following the Japanese surrender, the Indonesian nationalist leaders Sukarno and Mohammad Hatta issued a proclamation of independence on August 17, 1945. What followed was a four-year war in which the Dutch tried to reestablish colonial control over Indonesia, which eventually resulted in Dutch recognition of Indonesian independence on December 27, 1949. The National Revolution and its aftermath was crucial in shaping present-day Indonesian society and politics. After a period of chaotic parliamentary democracy, Sukarno declared martial law in 1957 and began his policy of “guided democracy”. Guided democracy was an ideology that blended nationalism, religion and communism into a concept known as “Nasakom.” Sukarno criticized Western-style parliamentary democracy as unsuitable for Indonesia and instead tried to create a system based off of traditional village consensus. Sukarno’s rule was marked by numerous rebellions and crises, including the period of military conflict between Malaysia known as Konfrontasi and conflict with the Dutch over the status of West New Guinea. During this time, the Communist Party of Indonesia (PKI) acquired more and more power, finally cumulating in an attempted coup on October 1, 1965 by alleged Communist sympathizers in the Armed Forces of the Republic of Indonesia (ABRI). However, this coup attempt was a failure and resulted in the commander of the Army Strategic Reserve Command (Kostrad), General Suharto, seizing power and putting down the coup. What followed was a widespread purge of the PKI in Indonesia, where as many as 78,500 to 1 million were killed for being suspected Communist sympathizers. The PKI, which had been the largest Communist party outside of the Soviet Union and China, was completely wiped out. Suharto then implemented his New Order policy which was anti-communist and pro-western in nature, stressed economic development, and was completely dominated by the military. The overall goal of the New Order was unity and stability. Suharto and his New Order Regime ruled Indonesia for over thirty years and managed to not only stabilize Indonesia’s economy, but make it prosper with Indonesia averaging a real GDP growth of roughly 5% and real per capita GDP tripling during this time. However, the Asian Financial Crisis of 1997 resulted in widespread rioting which finally forced Suharto to step down from power on May 21, 1998. 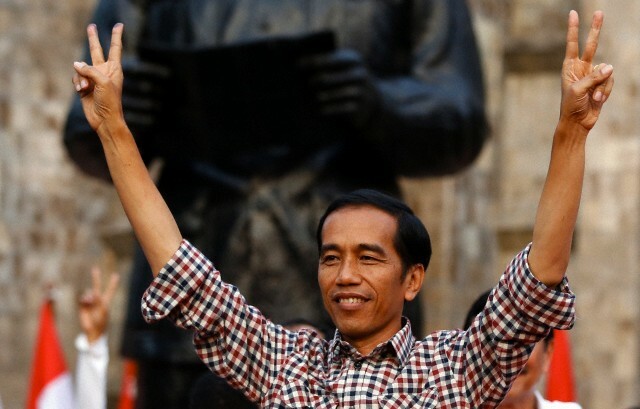 Following the end of the New Order era, Indonesia began an era of democratic reforms known as reformasi, with elections taking place in 1999 and further reforms gradually being enacted until the 2004 elections. Since the end of the New Order in 1998, Indonesia has enjoyed a stable democracy and relatively peaceful transitions of power, and is today the world’s third most populous democracy. The constitution has been in force since 1945, even during the period of military rule, but was last amended in 2002 to make the president subject to popular election and limited to two five-year terms. The president is both head of state and head of government. The president and the vice-president are elected on a single ticket, and the winning ticket must gain more than 60% of the popular vote and at least 20% of the vote in more than half of the provinces. If these requirements are not met, a second round of voting is held. The legislative branch consists of a lower house and an upper house. The lower house is composed of the House of Represenatives (DPR), whose members are elected to serve five-year terms and is composed of 560 seats, and its role is to formulate and pass legislation at the national level. The lower house also includes the House of Regional Represenatives (DPD). The DPD is composed of 132 members, four from each of Indonesia’s original 30 provinces, two special regions, and one special capital city district, and provides legislative input to the DPR on issues affecting regions. The upper house is the People’s Consultative Assembly (MPR), which is composed of members of the DPR and DPD, but its role is to merely inaugurate and impeach the president and amend the constitution, and does not provide legislative input. There are numerous political parties such as the Democrat Party (PD), Partai Golkar (Golkar Party), and the Indonesian Democracy Party–Struggle (PDI–P). The PD gained the largest number of DPR seats in the 2009 election. Indonesia held parliamentary elections this past Wednesday, April 9, 2014 and results will be announced soon. Since decentralization reforms implemented in 2001, municipalities and regencies have now become the main units for providing government services. The judicial system has been influenced by three sources of law: customary or adat law, Islamic law (sharia), and Dutch colonial law. The judicial branch is independent and co-equal with the executive and legislative branches. The two highest courts in the judicial branch are the Supreme Court (51 judges divided into 8 chambers; judges nominated by Judicial Commission, appointed by president with concurrence of parliament; andserve until retirement age) and the Constitutional Court (9 judges; 3 nominated by president, 3 by Supreme Court, and 3 by parliament; judges appointed by the president and serve until mandatory retirement at age 70). The subordinate courts are the High Courts of Appeal, district courts, religious courts, courts of general civil and criminal jurisdiction, and military courts. During the roughly 30-year period, for example, Indonesia averaged a real GDP growth of roughly 5 %, and real per capita GDP trebled. Average caloric intake increased by 70 %, average life expectancy rose from about 47 to 67 years, and the manufacturing and industrial sectors’ combined share of GDP rose from 19 % to roughly 65 % while agriculture’s share dropped from 53 % to 19 %. The incidence of poverty dropped from 61 % to 10 % on Java, and from 52 % to 7 % elsewhere in the country. In 1993 the World Bank placed Indonesia among the highest-performing developing economies and pointed to its its success in achieving both rapid growth and improved equity. Since the transition to democracy, Indonesia has continued to post strong economic growth and is currently classified as a lower middle income country. The GDP (purchasing power parity) of Indonesia is $1.285 trillion. The country’s gross national income per capita steadily rose from $2,200 in the year 2000 to $3,563 in 2012. During the 2008 global financial crisis, Indonesia, along with China and India, were the only members of the G20 to post growth. As this recent article in The Diplomat observes, Indonesia has gone from the world’s 27th largest economy in 2000 to the 16th largest in just fifteen years. Indonesia has averaged a 5.4 % growth rate since 2001, which is far above the global average despite the effect the global financial crisis of 2009 had on Indonesia’s neighbors. This growth has resulted in a fall of gross government debt from 95.1 % of GDP in 2000 to around 26 % today, the lowest of any ASEAN member-state except Brunei. This achievement has led Fitch and Moody to grant Indonesia investment grade status. The overall economic outlook for Indonesia continues to be positive. The McKinsey Global Institute estimates that Indonesia will be the world’s 7th largest economy by 2030, putting it ahead of the developed nations of Germany and the U.K. According to a Citibank report, Indonesia will be the world’s fourth largest economy by 2040. As the above article in the Diplomat points out, as Indonesia’s economy continues to grow and as the world begins to orient towards the Asian-Pacific, Indonesia will only benefit and its status will become more and more significant as it becomes a regional power and devotes more resources towards defense spending. For the industrial and manufacturing sectors of the economy, the main industries are oil and gas, food production, textiles, automobiles and other transportation equipment, electrical appliances, and chemical products. The natural resources of Indonesia include bauxite, coal, copper, gold, natural gas, nickel, petroleum, and tin. Tourism is also an important service industry. For the agricultural sector of the Indonesian economy, the major crops are cassava, cocoa, coconuts, coffee beans, corn, palm oil, rice, rubber, tea, and tobacco. Livestock includes buffalo, cattle, goats, horses, pigs, poultry, and sheep. Inland and marine fishing is also a valuable source of domestic protein and export. Indonesian exports totaled an estimated $158.2 billion in 2010. The main exports are (in order of importance): oil and gas, electrical appliances, plywood, textiles, rubber. Japan, China, United States, Singapore, South Korea, India, and Malaysia are Indonesia’s largest trading partners for exports. Indonesian imports totaled an estimated $127.1 billion in 2010. The major imports are (in order of importance): machinery and equipment, chemicals, fuels, foodstuffs. Singapore, China, Japan, United States, Malaysia, South Korea, and Thailand are the main trading partners of Indonesia for imports. Despite Indonesia’s rapid economic growth, problems still exist which could throw a wrench in its continued success. Out of a population of 253 million, more than 32 million Indonesians currently live below the poverty line and approximately half of all households remain clustered around the national poverty line set at 200,262 rupiahs per month ($22). Employment growth remains slower than population growth, and despite Indonesia being a middle-income country, public services remain inadequate by middle income standards. Indonesia is also doing poorly in regards to improving its health and sanitation facilities, and as a result, may fail to reach its Millennium Development Goals (MDG) targets in these areas. For instance, Per-capita health expenditure in 2006 was 2.2 % of the gross domestic product, which is the lowest among members of the ASEAN. Data from 2009 also shows that Indonesia still suffers from a high maternal mortality rate (307 deaths for every 100,000 live births), and the MDG target (105 deaths for every 100,000 live births) may not be met by 2015. Also, access to improved sanitation facilities currently stands at 68 % of the population, which remains significantly short of the MDG target of 86 %. Inadequate infrastructure continues to be a major impediment to economic growth in Indonesia. An IMF working paper finds that Indonesia’s infrastructure investment continues to lag behind its regional peers and that public investment in particular is low in Indonesia. This article in the Diplomat specifically identifies inadequate infrastructure which can’t handle the city’s rapid growth in car ownership as causing worsening gridlock on the streets of Jakarta. In short, Indonesia still has many aspects it needs to improve on if it wants to continue to enjoy the fruits of its economic success. The most prominent environmental concern of Indonesia is known as the “haze” where forest fires within Indonesia cause Southeast Asia to be affronted by a thick blanket of smog or “haze” year after year. The haze, in addition to harming the lungs of Indonesians, also hurts Indonesia’s relations with the whole of Southeast Asia. The fires are often deliberately started in order to clear space for palm oil plantations. Multiple laws and regulations have been passed outlawing the practice, but yet it continues due to the corruption of the palm oil companies and local officials. This illegal practice has also contributed to the deforestation of Indonesia’s rainforests, harming endangered species and driving out indigenous communities. Indonesia also suffers from some of the worst water pollution in the world. High levels of pesticide and fertilizer use in farming communities has resulted raised levels of toxicity in the water supply, excessive accumulation of algae in riverbeds, and the consequent destruction of marine life. The shortage of sewer facilities is also a serious problem as city waste is frequently discharged directly into bodies of water. This consequently results in repeated epidemics of gastrointestinal infection. Finally, soil erosion resulting from upland deforestation exacerbates silting in downstream waterways and the sea. This silting kills life such as coral reefs, and makes harbors un-navigable. Indonesia and China have historically had a frosty relationship ever since the beginning of the New Order regime. Indeed, Suharto viewed Beijing with suspicion because he viewed them as being complicit in almost bringing the PKI to power, along with supporting a “fifth column” of Chinese Indonesians. Suharto did not endear himself to Beijing through his purge of the PKI and subsequently demanding Beijing disavowal its support for communist insurgents in Southeast Asia. Ties have also been strained in the past due to massacres perpetrated against Indonesia’s ethnic Chinese community during the New Order regime and discriminatory laws directed towards ethnic Chinese Indonesians. However, China and Indonesia subsequently normalized diplomatic relations in 1990 and now ties are much warmer. With the South China Sea conflict looming large over the region and ASEAN, one role Indonesia has seen itself thrust into is serving as a mediator between China and the other states of ASEAN. However, with the recent news that China claims part of Indonesia’s territorial waters as it’s own, Indonesia could find itself gradually allying with the states of ASEAN rather than China. What will be important to observe is, as China continues to rise, the US rebalances towards Asia, and Indonesia’s clout in the region also rises, will Indonesia choose to side with the US or China? Indonesia is arguably one of Southeast Asia’s greatest success stories. It has moved on from the political instability and military rule that followed its independence from the Dutch, and has become a thriving democracy and one of the fastest growing economies in the world. Despite this, Indonesia still has many challenges to overcome such as widespread poverty, inadequate infrastructure and environmental degradation. However, the future is bright for Indonesia and its clout and status in the region will only increase. With this in mind, the only question is whether Indonesia will align itself with the US or with China in the future. Basic country report prepared by Thomas Holt, May 2014. Beng, Phar K. “Don’t Overlook Our Neighbour.” New Straits Times, 16 Feb. 2012. Web. 6 Apr. 2014. Halimi, Abdul-Latif. “The Regional Implications of Indonesia’s Rise.” The Diplomat, 10 Apr. 2014. Web. 10 Apr. 2014. < >. Hamer, Alex. “Jakarta’s Troubled Infrastructure.” The Diplomat, 30 Jan. 2014. Web. 6 Apr. 2014. < >. Keck, Zachary. “China’s Newest Maritime Dispute.” The Diplomat, 20 Mar. 2014. Web. 6 Apr. 2014. “Leaders Fiddle as Sumatra Burns.” The Economist. N.p., 22 Mar. 2014. Web. 6 Apr. 2014. Nayak, Shivali. “Indonesia’s Economy to Surpass Germany, UK by 2030: McKinsey.” CNBC, 25 Sept. 2012. Web. 6 Apr. 2014. Seneviratne, Dulani, and Yan Sun. “Infrastructure and Income Distribution in ASEAN-5: What Are the Links?” (n.d.): n. pag. International Monetary Fund, Feb. 2013. Web. 6 Apr. 2014.